Since 14 November 2015, the dockers of Lisbon are, once again, on strike against the introduction of precarious labour in the ports, and are doing so under the most vile attacks by the capitalist class. For decades, big port companies have been trying to end professional stowage and, especially, end the power of the strong union of dockworkers, which has prevented precariousness in the port of Lisbon until now. The struggle of Lisbon’s dockworkers has been crucial to the fightback against this process, provoking the bosses’ hatred, who mobilize any means at their disposal to vilify the workers. That mobilization is particularly evident in the way the corporate media “reports” on the strike. In 2014, Lisbon dockers won a drawn-out struggle against precariousness and were able to sign a collective bargaining agreement which would integrate all precarious workers. Bosses have never respected it. Instead, they try to undermine the dockers’ organization, by setting up ficticious companies to reintroduce precarious workers and without proper training, creating a faux-trade union and accumulating wage arrears. The bosses, by forcing the utilization of precarious workers in Lisbon’s port, are the ones to blame for this strike. The workers have declared, time and again, their willingness to work their normal eight hour shift, as long as there is no precarious work on the docks. They equally state that they have nothing against precarious workers themselves. On the contrary, they want the same conditions to apply to both precarious and professionalized dockers. If anyone is responsible for the chaos provoked in the supply of goods, it is the bosses! Mobilize in solidarity with Dockers! 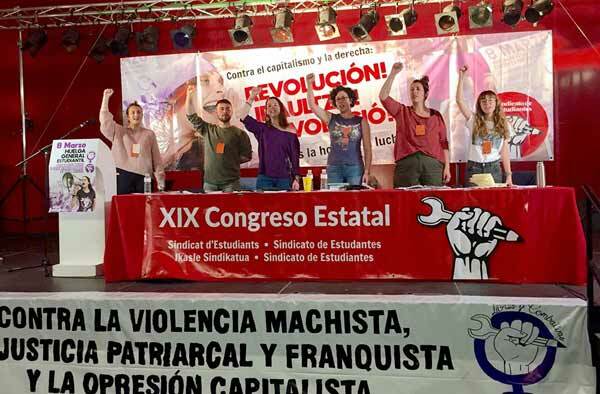 When the Left and workers’ movement launch campaigns against precariousness, we ask: what are the current leaderships waiting for to mobilize their strength next to the dockers? A victory in Lisbon’s port would be the best boost for such campaigns. It is hard for a strong, but small, trade union to break free from the isolation of the difamatory campaign now underway against them by big business. It is the Left and trade union movement as a whole who have that capacity. Small parliamentary solidarity declarations are not enough, it is necessary to wage a systematic counter-propaganda campaign, set up from all platforms we have - the Left MPs should serve that purpose! More important than that, it is urgent to organize a plan of mobilizations, demanding the end of precariousness in the ports and the full revoking of the new law of the ports, introduced by PSD/CDS (former right-wing government). Socialismo Revolucionário stands in solidarity with the docker’s struggle, and will do everything in its power to support it. We appeal to all the Left and to the worker’s movement to mobilize in support of this struggle. I’ve become aware, through our comrades in Socialismo Revolucionário, of the important and hard struggle your trade union is fighting against precarious working conditions in Portugal’s ports. I stand in full solidarity with you and all dockworkers on strike. I fully recognize the justice of your demands and their importance in the european context of struggle against precariousness and for living working conditions.